To test how wind energy affects carbon dioxide emissions, Argonne scientists modeled the Illinois electric grid to test how more wind power would affect the system. Image courtesy Sharon Loxton. (Phys.org) -- Wind energy lowers carbon emissions, but adding turbines to the current grid system does not eliminate emissions proportionally, according to a report by researchers at the Argonne National Laboratory. To test how wind energy affects carbon dioxide (CO2) emissions, Argonne scientists modeled the Illinois electric gridpower plants, production and demand -- and tested how more wind power would affect the system. 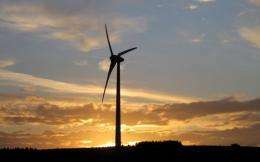 They found that adjusting for wind power adds inefficiencies that cancel out some of the CO2 reduction. Its actually the older technology in the background that hampers wind. Because the wind doesnt blow all the time, operators occasionally have to turn on extra fossil-burning plants to keep up with demand. Turning these large plants on and off is inefficient, explained study author Lauren Valentino. A certain percentage of the energy goes into just heating up the boilers again. Power plants are also less efficient when theyre not operating at full capacity. Like many states, Illinois has pledged to get 25 percent of its energy from clean sources by 2025. But it still has a long way to go; in 2010, the state got 2.2 percent of its energy from wind. Illinois gets its strongest winds at night, when demand is low, said co-author Audun Botterud, an Argonne energy systems engineer. "At the same time, we have a high fraction of very large, inflexible power plants in the system." This is a problem because its inefficient to turn larger plants off and on to accommodate sudden influxes of wind power. The best solution, he said, would be a way to store unused energy when the wind is blowing. But we dont have a good way to store large amounts of electricity, a problem Argonne battery scientists are tackling elsewhere at the lab. In the meantime, smarter electric grids can help by leveling out demand. The study, Systems-Wide Emissions Implications of Increased Wind Power Penetration, a collaboration between researchers at Argonne and summer interns Valentino (University of Illinois at Urbana-Champaign) and Viviana Valenzuela (Georgia Institute of Technology), was published in Environmental Science & Technology. Other Argonne co-authors are Zhi Zhou and Guenter Conzelmann. In a related study published in Wind Energy, researchers investigated the use of advanced forecasting and operational strategies to accommodate more wind energy in the power grid. The research was funded by the DOEs Office of Energy Efficiency and Renewable Energy. The solution is to get the fossil fuel burning plants out of the system. Replace them with more renewables and storage. Yes, can't be done overnight. But the alternative is to keep screwing the planet. With what renewables? More wind power? Turn forests into monoculture tree farms to get biofuel? Dam more rivers? The keystone in this question is the energy storage method, and it is not a trivial problem at all. Without it, everything else is pointless tinkering - although very profitable to those who sell the windmills and solar panels to people who don't understand the issue. At the moment, all the renewable energy policies are simply wasting money to build technology that does not help, when they should be spending it on developing the technology that is needed in the first place to make it work. This technology is advancing rapidly, with steady price drops. $300 per kWh of storage for 5000 cycles (With how much capacity depreciation? ), neglecting the other system costs like the chargers and inverters and grid-ties, energy losses, is still $60/MWh on top of the base electricity price. It's very interesting to find out how much Co2 is produced while making this monster of a "battery". Will it create less CO2 to just run a coal plant than to use this battery for 5000 cycles and then throw it away. The UK has spent hundreds of billions of pounds on wind and it is quite common for them to only get .5% to 1% of their electricity from wind. To get 100% they would need to spend about 200x what they have spent so far. 125 billion pounds is their health care budget for the year. So, they could cut health care spending to zero for 200 years ... and by then 90% of the wind turbines would have already failed and/or worn out. And they would have to spend another 10 trillion ... and so on. Could fusion is even more flexible as it even doesn't require a storage (or quite minimal one, like the supercapacitors). Why to invest into research of technologies, the application of which would take a years and not into most effective way directly?